CUSTOMER SERVICE, SAFETY, & PRODUCTIVITY. Duffey Concrete Cutting, Inc. was founded in 1976 by Timothy A. Duffey, Retired and Incorporated in 1980 with Randall Z. Lewis, President. Tim and Randy have built a successful business based on quality service and loyal commitment to our customers. Duffey Concrete Cutting has earned the respect of countless contractors and owners in developing and implementing new equipment for highly complex and sensitive projects without forgetting our roots in the day to day service work. Our goal is to achieve outstanding customer satisfaction while following safe work practice in the most productive manner. Scott LeStrange, Vice President manages daily business activities and dispatches our operators. 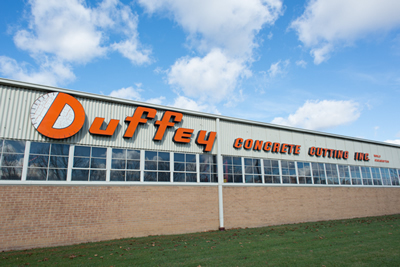 Duffey Concrete employs thoroughly trained professional operators and mechanics. Our operators make up a fleet of fully equipped vehicles that can be dispatched immediately from any location to meet any specific job requirements. Our mechanics ensure optimum working condition of all equipment, eliminating repair delays. This high quality equipment enables us to provide fast, safe and high volume service at a fair, honest price. Duffey Concrete Cutting makes sure to keep up to date on safety and paperwork requirements. Carrie Hrebic, Controller manages daily activities in the office. We strive to stay up-to-date on regulations and procedures that are required for our industry. Duffey is dedicated to providing professional services to our customers with the proper support team to make sure things go as smoothly as possible.